Rock Climbing 101: Top Squamish Climbs and More! Every summer, climbers from around the world flock to the granite cliffs and bluffs overlooking Howe Sound to test themselves on some of the most beautiful and accessible rock climbing in the world. For beginners, Squamish offers a unique playground with ample opportunity to learn the basics and safely ease yourself into the world of rock climbing. Read on to hear what the local experts have to say about getting started climbing in Squamish. Share the cost of a rope: The start-up cost to get on the walls can be expensive, Eric from Mountains Skills Academy and Adventures suggests splitting the cost of the rope with a friend. In addition to saving money co-owning a rope also ensures you have a committed climbing partner to start out with. Take a course to master the basics: Learning the basics of top roping from a qualified guide is an essential step for new climbers. A climbing course will teach you the fundamental skills of anchor making and basic climbing techniques so you can get moving on your own. Buy comfortable shoes: Aaron from Valhalla Pure Outfitters tells new climbers to go for a shoe with a glove-like fit. Most shoes will stretch out slightly, so a touch of discomfort is alright but if there is any pain size up! After you wear out your first pair of shoes, you will have a better idea of what you want for next time. Use your legs: Many new climbers worry that they do not have enough upper body strength to be able to pull themselves up the wall. However, Colin from Squamish Rock Guides explains that especially in the beginning stages, the power for upward movement on rock comes from your legs. Your arms are used more for balance. Buy a local guidebook: Brian from Canada West Mountain School explains that there are many “top ropeable” climbs in Squamish, meaning climbers can set up the rope by walking to the anchors rather than climbing. The Squamish Select guidebook provides a full list of top-rope accessible climbing and explains useful details about the routes and how access anchors. Having a guidebook will save you heaps of time and allow you to find new locations to practice. Practice mock leading on top rope: Some top ropers may have difficulty transitioning to lead climbing. Matt from Escape Route recommends placing gear or clipping quickdraws on top rope to gain confidence before you lead climb. A moderate 5.10 climb with a variety of techniques required. This route involves face, crack and slab climbing making it the ideal route for climbers looking to diversify their skill set. You can find this climb located at the Ronin's Corner Crag in Smoke Bluffs Park; it is top rope accessible. A 3-pitch 5.9 route set over the emerald green waters of the Cheakamus River. You must rappel to the base of the climb which adds an element of adventure. The climb follows an arete, a sharp corner on the rock face which feels very exposed. Eric describes Star Chek like climbing a ship's prow; there is nothing on either side of you and below is water. Please note the bolts on the route are very spaced out, it is only recommended if you are comfortable leading above a 5.9 level. Smoke Bluffs has historically been the beginning of many great climber's journeys, it is ultra accessible, fully loaded with climbing opportunities and has plenty of top rope climbs. Aaron recommends Octopus's Garden to beginners because it is top ropeable, has a good variety and is just far enough away from the parking lot that you can often enjoy the crag to yourself. Conroy's Castle is just a stone’s throw from the parking area and offers beginner-friendly sport climbing. Most of the routes on this wall are 5.9 and below making them an excellent location for beginner sport climbers to refine their lead skills. The camping area next to the parking lot was refurbished by BC Parks last summer and is a lovely spot to unwind after your climb. Consistently rated as a top location for beginners Burgers and Fries offers all the amenities a new climber may want; it is easy to set up a top rope, there are picnic benches for relaxing between climbs, and it's a quick walk from the parking lot. The crag is also somewhat slabby making it an ideal place to work on footwork and to give your arms a break. To get started every climber will need the six essentials; a helmet, harness, shoes, belay device, one locking carabiner and chalk. Every pair of climbers will also need a rope and anchor building materials such as a 120cm sling and four locking carabiners. It is also recommended to have a personal tether and locking carabiner for edge safety when setting up anchors. Valhalla Pure Outfitters and Escape Route both carry an extensive supply of gear to purchase and have knowledgeable staff to help you find the right equipment and shoes. Rental shoes and crash pads for bouldering are available to rent at Valhalla Pure Outfitters, and the whole gamut is available at Mountain Skills Academy and Adventures. Enjoy a day with a local Association of Canadian Mountain Guides (ACMG) certified Rock Guide and experience some of the best rock climbing routes Squamish has to offer. A day of climbing the classics with a professional will save you the hassle of trying to figure out where the best climbs are so you can layback (pun intended) and climb your way up to the best views in town. The "Intro to Rock Climbing" course is designed to provide students with a complete and reliable skill set to climb with confidence. In this course, students learn to belay, build anchors, manage hazards, and climb safely. To help more people get on the rock, new for this summer climbers can save money and bundle a beginner's climbing package from Climb On with a climbing course from Mountain Skills Academy and Adventures. 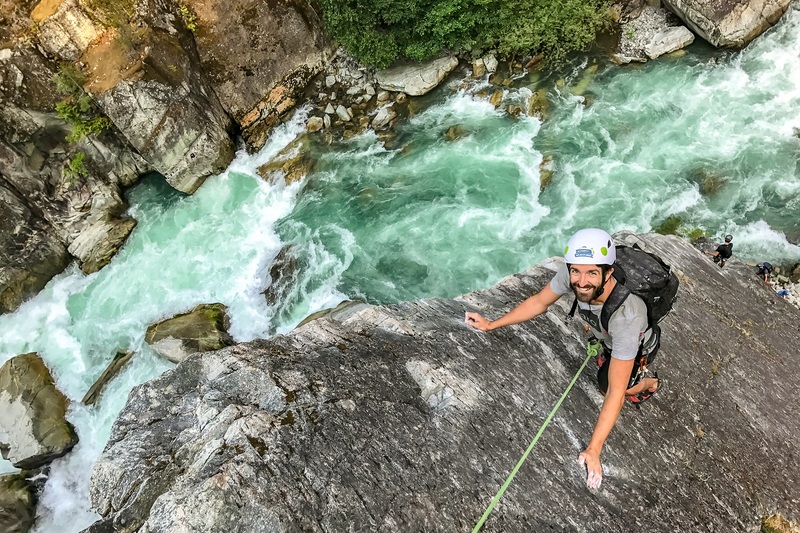 A half or full-day guided climb with Squamish Rock Guides gives you the unique opportunity to be taught by some of Canada's most elite climbers. Choose to focus your day on specific technical instruction or push the upper limits of your abilities by following your guide up one of your dream routes. Guides are certified through the Association of Canadian Mountain Guides. If you are already comfortable climbing top rope, a "Sport Lead Climbing" course can elevate your skills to the next level. In this one-day course, you will learn about equipment selection, belay techniques, lead climbing principles, movement coaching and more to help you become comfortable outdoor lead climbing on rock. When you climb with a guide, you can push yourself and focus on unlocking new climbing skills. Masters of both climbing and teaching climbing, the guides at Mountain Skills Academy and Adventures will teach you new techniques, help you discover new holds and increase your confidence on the wall. Choose from popular climbing objectives such as Star Chek, Sky Walker, or select a bucket list route up the Stawamus Chief. For climbers who already have some belaying and climbing experience, Squamish Rock Guide's "Top Rope Anchors" course is the ideal next step before venturing to the crag. Topics for the day will include crag safety, knots, anchor integrity, bolt anchor construction, tree anchor construction and multi-point anchor construction. There will be time for climbing and technique coaching, and the day will conclude with a rappel. Just in time for summer, Mountain Skills Academy and Adventures and Climb-On Squamish have partnered to offer a beginner gear and introductory course promotional package. Climbers can save 10% off a one-day or two-day Intro to Rock Climbing Course by using the code CLIMBON10. Any client who books a course will receive an exclusive 10% discount on the beginner's rock climbing package at Climb-On which includes a harness, chalk bag, chalk, a belay device and locking carabiner for $103.50+tax after the discount. The Squamish Access Society (SAS) is a dedicated group that works on behalf of climbers to protect climbing access and encourage environmental stewardship of the climbing environment. SAS is directly involved with trail improvements, crag cleaning, route retrofitting and everything that improves the Squamish climbing environment. Climbers are encouraged to support SAS with a $10 donation. You can donate to SAS here. Looking for More Great Squamish Ideas? Packed with everything you need to know to get the most out of your stay. You can pick up your copy at the #Squamish Adventure Centre or view it online here.